Sheelasha Rajbhandari is a visual artist based in Kathmandu. Her mixed media installations explore the parallel – yet, often contradictory – existence of traditional beliefs and historic ideas with contemporary events and evolving lifestyles. She is interested in comparing her own emotions and opinions with existing collective values through dialogues with members of different communities. Her artworks usually juxtapose these contradictions and attempt to synthesise the knowledge and experiences that result from these varied discourses. Rajbhandari is very careful about choosing materials and methods that align with her conceptual framework. She prefers mediums and material that add meaning to ideas and have their own significance. Her artwork was exhibited as part of Parallel Realities show at Moesgaard Museum of Denmark in 2016. That same year, she was also selected for the Asia Contemporary Exhibition at Jeonbuk Mesuem in Korea. She was represented by Nepal Art Council for the India Art Fair in 2016. In 2014, she was nominated for the Signature Art Prize organized by the Asia Pacific Breweries Foundation in Singapore. That same year, Rajbhandari was selected for Abhisaran, Vijaynagar Art Residency, organized by JSW Foundation, India. She has also exhibited with Asian Art Biennale (Bangladesh, 2010). In 2013, she was invited by The Center for culture and Development, Denmark (CKU) to participate in the Images Festival. 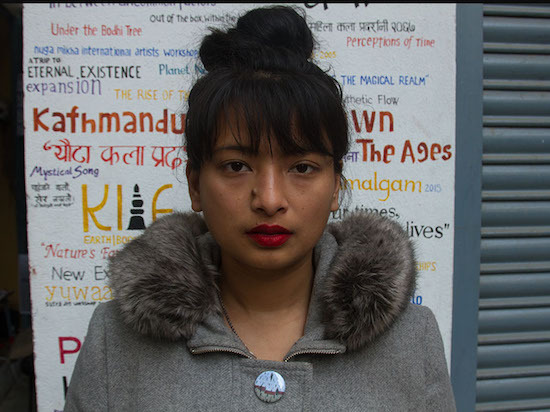 She was also selected for the second Kathmandu International Arts Festival that took place in 2012. Her solo show, “In – Between Uncommon Factors” was held at the Nepal Arts Council in 2010.